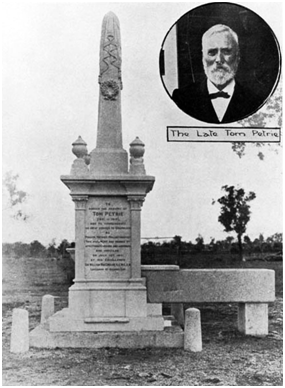 The Tom Petrie Memorial was unveiled by the Governor of Queensland, Sir William MacGregor, on 15 July 1911. Although it has been moved twice, the monument remains a landmark in the park adjacent to the North Pine School of Arts. Its initial location, on the corner of Redcliffe Road (Anzac Avenue) and Whites Road, was about thirty metres east of its present site. At the original site, a water trough positioned alongside the memorial was connected to a nearby windmill. The monument, minus the trough and windmill, was later relocated a short distance to a central position near the former junction of Redcliffe Road and Dayboro Road before being finally moved to its present position during the mid 1980s. 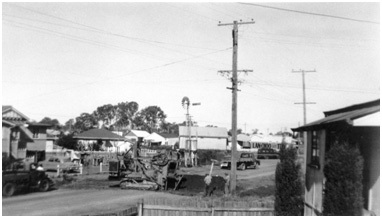 The water trough and windmill remained in use near the intersection of Anzac Avenue and Whites Road until the 1960s. Courtesy of the ‘Queenslander’, 22 July 1911. Tom Petrie’s epitaph, engraved on a marble tablet set into the sandstone obelisk, reads, in part: “Pioneer, Patriot, Philanthropist”. Only a few weeks before the memorial was unveiled, the Department of Railways also commemorated Tom Petrie, who had passed away on 26 August of the previous year, by changing the name of North Pine Railway Station to Petrie. As postal operations were being conducted from the station at this time, it also became necessary to change postal addresses. Many local residents opposed the name change and the issue generated a great deal of controversy for many years. Water pipes were being laid down Young Street and across Anzac Avenue to supply the Australian Paper Manufacturers (APM) Petrie Mill (now Amcor) with water from Lake Kurwongbah. The windmill and overhead tank can be seen near the centre of the photograph. The water trough, previously associated, with the Tom Petrie Memorial, remained in use at this site until the 1960s. The Tom Petrie Memorial is arguably the most significant monument in the Pine Rivers District. In view of this, the Moreton Bay Regional Council has submitted a grant application seeking State Government funds to refurbish the memorial, either at or near its present location, or on the opposite side of Anzac Avenue close to its original location. Voting Day at the North Pine School of Arts, 1983. The Tom Petrie Memorial (at its second location) can be seen at the right of the photograph. Courtesy of Dr. Robin Cooke.